In this menu, you can customize your wallpaper, change the theme and select the language of the web interface. Wallpaper Customize the wallpaper of your desktop. Themes Select your preferred theme from the list of available designs. 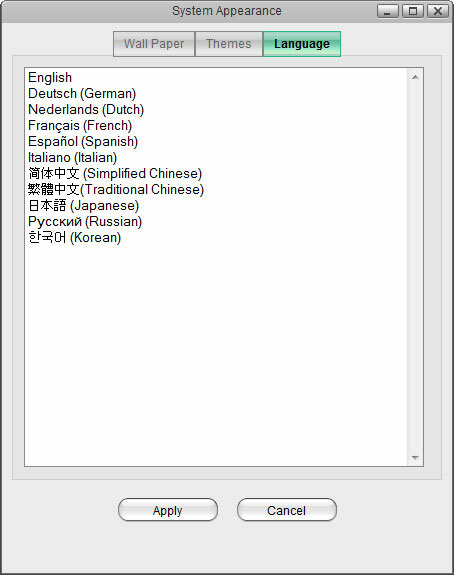 Language Select your preferred language for the web interface from the list of available languages. Replace the default wallpaper to add your personal touch. Select one of the stock images or load one of your own photos. 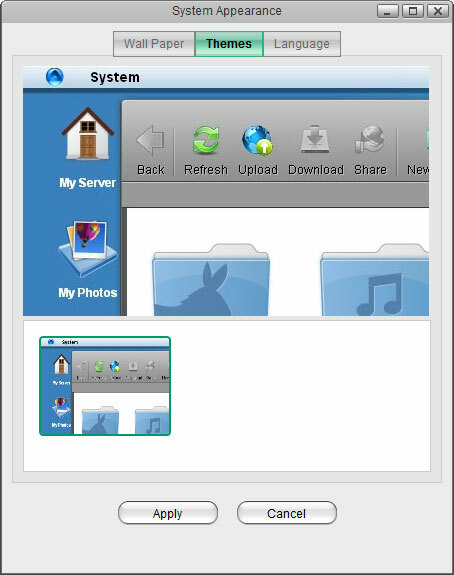 To keep it fresh, select a folder where you have stored your own images and then enable the slideshow function. This will cycle through your photos and load a new image at a preset interval. Choose a folder Click Open and select the folder where your own images are stored or click View system wallpapers to view the stock images. Click on your preferred image in the preview window to set a new wallpaper. Position Select how the image is displayed from the drop-down menu. 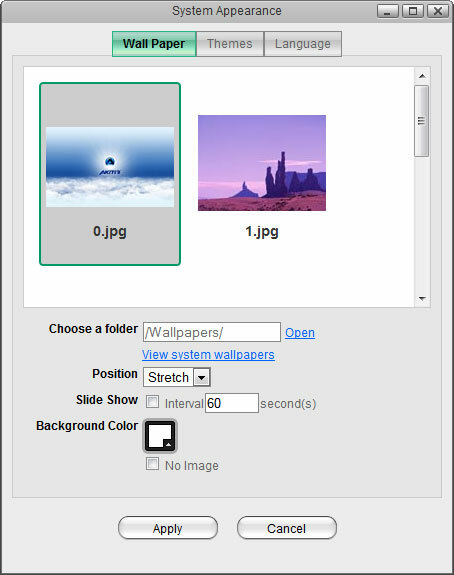 Stretch: Stretch the wallpaper to desktop size. Center: Place the wallpaper in the center of the desktop. Tile: Display the wallpaper as a pattern of images. Fill: Make the wallpaper fill the desktop and cut the overflow off. Fit: Make the wallpaper fit the desktop without overflow. Slide Show Enable this option and set an interval in seconds to cycle through the images in the selected folder at a preset interval. Background Color Select a solid color for the background and then enable the No Image option to hide the wallpaper image completely and use just a single color instead. Click on the thumbnail in the lower window to select your preferred theme and then click Apply to save the settings. Please note that there is currently only one theme available, so there are no options to change the theme at this time. Select your preferred language for the web interface from the list of available languages and then click Apply to save the settings.